Venezuela astounds one with its biodiversity. 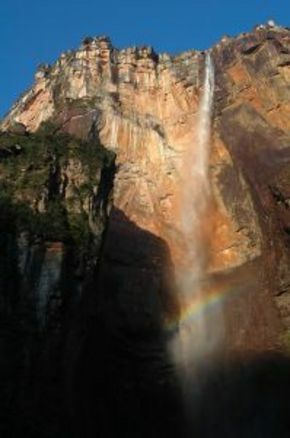 The Pre-Cambrian flat-topped mountains (tepuis) are indeed unique in Venezuela (the world’s highest waterfall; the Angel Falls plunges from the top of one such tepui in Parque Nacional Canaima). However, the South American country has almost every physical feature – off-shore isles, beaches (playas), wetlands, mountain peaks, lakes, water-falls, river-systems, inner fertile plains (Llanos), deserts as well as sand-dunes and an abundance of flora and fauna. Venezuela, however, is as much a nature-lover’s paradise as a modern urbanized country. So, if your days bound in adventure activities like hiking, snorkeling, scuba diving, windsurfing, paragliding, Venezuela also comes forward with promises of varied night-time entertainment in the form of night-clubs and pubs as well as quality shopping. Caracas: Caracas the capital city of Venezuela is also the largest and most populous city. Standing close to the Venezuelan coastal mountain range, Caracas is famous for its scenic beauty and pleasant climate. The city has a number of parks and gardens like the Avila National Park and the East Park. A cultural hub of the nation, Caracas is famous for its Theater Festival; among the other city-sights are its art galleries and museums. Vibrant nightlife and quality shopping are among the other indulgences that Caracas promises to you. Valencia: Venezuela’s third-largest city, Valencia is perfect family holiday destination. A place of great natural beauty, Valencia also has many man-made attractions like the Valencia Aquarium and the Las Dunas Amusement Park. The city has some beautiful parks. Valencia’s art-galleries, museums and theaters give you a taste of the city’s lively cultural atmosphere. Ciudad Bolivar: Ciudad Bolivar is one of Venezuela’s historically and culturally significant cities. Among the city’s historic attractions are its colonial structures like the Ciudad Bolivar Cathedral, the Plaza Bolivar, the Old Prison, the Parochial House, the Government Palace, etc. Ciudad Bolivar is also famous for its fairs and fests. The city’s art gallery, Jesus Soto Museum of Modern Art, should also find a place in your itinerary. By virtue of its petroleum-trade, Venezuela was once the strongest economy in Latin America and the Venezuelans enjoyed a high standard of living. However, fall in petroleum prices combined with widespread corruption, mismanagement and political instability, led to the undoing of the Venezuelan economy. Attempts are on to revamp the economy through diversification; although the petroleum sector still dominates the economy, the government is also tapping its wealth of natural resources (other than petroleum); the industrial as well as the services sectors are being developed. Venezuela has an extensive road-network, but rail-transportation is very weak, spread over only a few hundred Kilometers. Telecommunications is well developed. Venezuelan culture is the blend of cultural influences of the people/ethnic-groups that have shaped the history of Venezuela – predominant among these have been the influence of the indigenous American Indians, of the Spanish settlers and that of the African slave population brought here. This cultural mix has given Venezuelan a new identity and today Venezuela has its unique architecture, art and crafts, cuisine, literature, music and even a unique way of life.